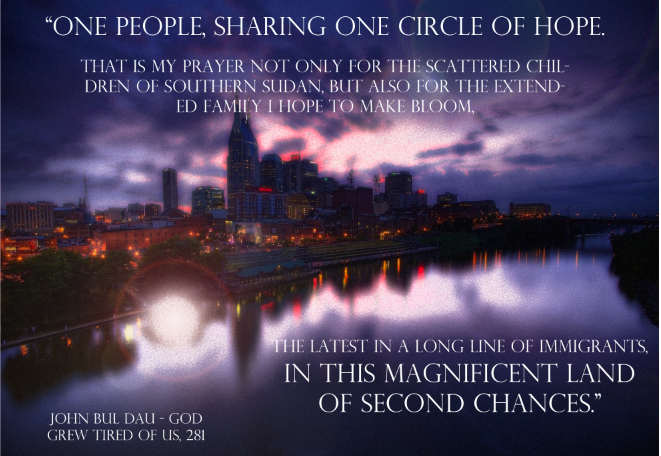 I chose this quote from the book "God Grew Tired of Us": "One people, sharing one circle of hope. That is my prayer not only for the scattered children of Southern Sudan, but also for the extended family I hope to make bloom, the latest in a long line of immigrants, in this magnificent land of second chances." (John Bul Dau, 281) because it is very powerful and relates to the issue of refugees in Sudan. There were many other powerful quotes in the books as well, for example: "For 14 years I lived without a family of blood relatives in the refugee camps of Pinyudu and Kakuma. I learned that if you do not have a family, you must make a family in order to survive." (John Bul Dau, 280) and "They call me a Lost Boy, but let me assure you, God has found me" (John Bul Dau, 7). At the end of the quote it says "In this magnificent land of second chances." which is referring to the United States, so for the word art I found a beautiful photo for the United States and then through photoshop I added filters, blurs, outlines and text to it. If I had more time I would have like to draw it instead, but through the process of using photoshop I did learn how to add filters, outlines and blurs. The quote is about how there is hope for the scattered children (refugees) and his family in the United States and how for him and many of the other sudanese refugees that immigrated to Canada at the time, had a second chance at life by having the opportunity to live peacefully and happily.